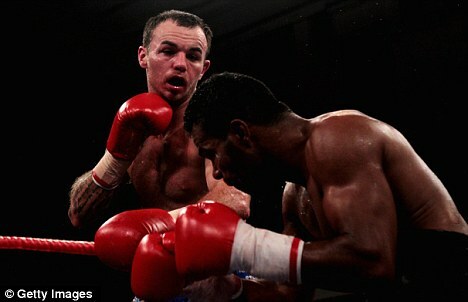 Kevin Mitchell has vowed to dethrone world champion Ricky Burns after returning to the ring with a points victory over Felix Lora. The 27-year-old thrilled a packed York Hall in London with a solid, if unspectacular victory over 10 rounds. And the Dagenham fighter has his eye on a summer showdown with Scotsman Burns. 'I'll be world champion in the summer, I promise you,' Mitchell told Sportsmail. 'Ricky Burns is a lovely lad but I'm going to have to beat him. Mitchell had predicted he would face a tough test against Barcelona-based Lora and he was pleased with his nights work. 'I knew it would be a tough,' he added. 'I looked at his record and realised he hasn’t been stopped by many fighters and if he has been stopped, it was by a welterweight. 'I could have knocked him out in the 10th but I let him off. I could have done it earlier if I wanted to but I wanted to hit nice and clean, slip shots, show my class and get the 10 rounds in. 'Boxing wise, it was an easy fight. If I'd got into a scrap I could have knocked him out but I would have been hit myself. I boxed round him and I know the crowd wanted me to do what I normally do but sometimes it's best to do the unexpected. 'It felt nice to be back in front of my home crowd, I gave them a few spells. Tibbs meanwhile was delighted with his charge's performance. 'Obviously I’m very pleased with the ten rounds, he boxed to orders, he got him down in the second round… he let him back in the fight just because he wanted to. That’s Kevin,' he said.